Click a thumbnail to find out more about the slideshows below. 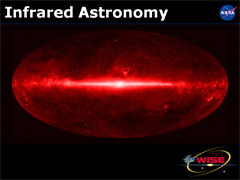 This interactive astro snapshot from the AMNH shows how WISE will discover brown dwarfs in the infrared wavelengths. Members of the WISE science team compiled an image gallery of some of the mission's colorful cosmic snapshots. This slide show provides background information about infrared light and what astronomers can learn by observing it. 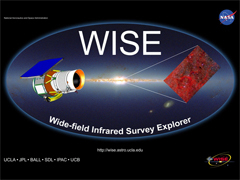 This slide show delivers a general introduction to the WISE mission and the science behind it. 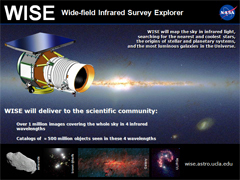 This slideshow delivers a general introduction to the WISE mission and the science behind it. This slide show was created to run at the WISE exhibit booth at the January 2010 Meeting of the American Astronomical Society in Washington, DC. It gives a pictorial history of the WISE mission.